In a post that appeared at this site over eight years ago, I described some of the distinctive features of the Pectinoidea, the group of bivalves commonly known as scallops. It's time to look in a bit more detail at some of the points mentioned in that post. Fossil of Pernopecten, the earliest scallop genus, from ammonit.ru. Pectinoidea, in the sense recognised by Waller (2006), first appear in the fossil record way back in the late Devonian. 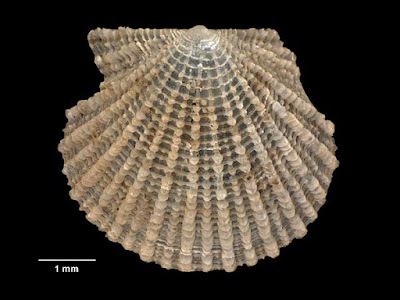 They were probably derived from earlier members of the Aviculopectinoidea, an extinct group of bivalves that closely resemble scallops in their overall appearance and were included in the Pectinoidea by many earlier authors (such as in the 1969 Treatise on Invertebrate Paleontology volume on bivalves). However, the shell ligament of aviculopectinoids was reinforced by aragonite fibres (a primitive feature for bivalves) rather than having the specialised rubbery core found in pectinoids. 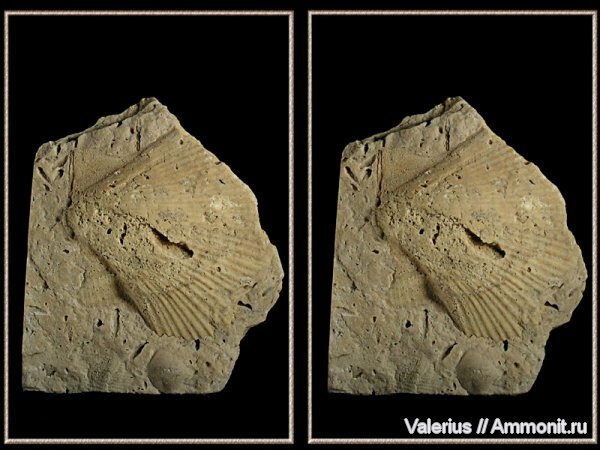 As such, aviculopectinoids would have lacked the swimming abilities of true scallops. The Palaeozoic pectinoids belong to a single genus, Pernopecten, that possesses a number of features such as details of the shell crystalline structure that indicate a position outside the pectinoid crown group. In the early Triassic, Pernopecten begat the family Entolioididae that includes the ancestors of living pectinoids. As mentioned in the previous post, four pectinoid families survive to the present day: the Pectinidae, Propeamussiidae, Entoliidae and Spondylidae. The first three families diverged in the early Triassic. Spondylids (usually classified in a single genus, Spondylus) were not to appear until the mid-Jurassic and Waller (2006) argued for their derivation from within the Pectinidae. The Pectinidae are otherwise distinguished from other pectinoids by a structure called the ctenolium. This is a row of teeth that develops on the shell in the gap between the disc and one of the auricles (the triangular 'wings' at the top of the shell). During the earlier part of the scallop's life, when it lives attached to the ocean bottom by a byssus (what in mussels we call the 'beard'), the ctenolium functions to hold the byssus threads in place and help stop the shell from twisting. In those pectinid species that lack a byssus in the latter part of their life, the ctenolium may end up getting overgrown by the expanding shell and disappearing, but all pectinids (ignoring the aforementioned Spondylus question) have a ctenolium for at least part of their life. The propeamussiid Cyclopecten secundus, copyright Museum of New Zealand Te Papa Tongarewa. The Pectinidae is the largest scallop family in the present day, followed by the Propeamussiidae. The Entoliidae were diverse during the Mesozoic but declined dramatically after the end of the Cretaceous (I'm not clear whether or not their decline was a direct part of the end-Cretaceous mass extinction). Indeed, entoliids are completely unknown from the fossil record between the Palaeocene and the late Pleistocene; like the tuatara, it might be that the post-Mesozoic survival of entoliids could have gone completely unrecognised were it not for the single surviving relictual genus. In the earlier post, I implied that propeamussiids lack the eyes and guard tentacles of other pectinids; it turns out that this was a mistake on my part. Many propeamussiids found in the deep sea do indeed lack these features but they are present in shallow-water propeamussiids. It appears that these features are ancestrally common to all crown-group pectinoids but have been lost as an adaptation to life below the photic zone. The anatomy and lifestyle of many propeamussiids remains poorly known but those species that have been investigated have simplified gills compared to pectinids. The filaments of the gills are free rather than being connected by ciliary junctions. The lips of the mantle are also simplified, lacking the complex lobes found in pectinids. These features may be related to the carnivorous diet of many propeamussiids that feed on zooplankton rather than smaller phytoplankton and organic particles. Waller, T. R. 2006. Phylogeny of families in the Pectinoidea (Mollusca: Bivalvia): importance of the fossil record. Zoological Journal of the Linnean Society 148 (3): 313–342.